ABC’s version of “Clue” has announced the players of the new interactive reality, crime-solving series called “Whodunnit” produced by Anthony E. Zuiker (“CSI”) and Cris Abrego (“Rock of Love”). The thirteen contestants of this new reality genre will be competing for a grand prize of $250,000. Hosted by Gildart Jackson as the Mansion Steward, Butler Giles, the show will place these strangers on a glamorous estate called Rue Manor where they will have to solve a murder. Most players already either have a natural knack at problem solving and their jobs reflect that. Others, like a former cheer-leader, and a flight attendant, crime-solving skills are questionable. Players will use a variety of crime scene investigation techniques to meticulously uncover evidence in a series of puzzling murders and to ultimately reveal who among them is the killer. Some players will form alliances in the competition, while others will choose to go it alone in their quest for the grand prize of $250,000. The contestants will be guests on a glamorous estate called Rue Manor with a steward, Butler Giles (Gildart Jackson), and each week must solve a new crime in order to advance in the game. Failure to solve the crime will lead to a player’s demise, until only three are left. In the final episode, one player will unmask the killer and take home the $250,000 prize. “Whodunnit?” is an interactive series that puts 13 amateur sleuths’ investigative skills to the test in a riveting mystery reality competition. Players will use a variety of crime scene investigation techniques to meticulously uncover evidence in a series of puzzling murders and to ultimately reveal who among them is the killer. Some players will form alliances in the competition, while others will choose to go it alone in their quest for the grand prize of $250,000. The contestants will be guests on a glamorous estate called Rue Manor with a steward, Butler Giles (Gildart Jackson), and each week must solve a new crime in order to advance in the game. Failure to solve the crime will lead to a player’s demise, until only three are left. In the final episode, one player will unmask the killer and take home the $250,000 prize. 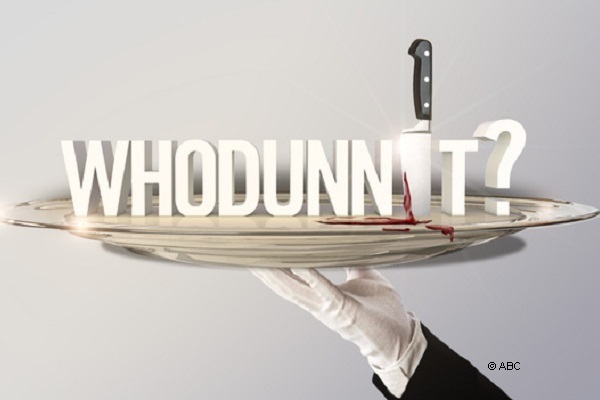 “Whodunnit?,” premieres SUNDAY, JUNE 23 (9:00-10:00 p.m., ET) on the ABC Television Network.